The author, Chuck Stead, is an environmental educator with Cornell Cooperative Extension of Rockland County, an adjunct professor of Environmental Studies with Ramapo College of New Jersey, restoration consultant to the Town of Ramapo, and the director of education with the Ramapo Saltbox ERC. He is currently a doctoral candidate at Antioch School of Environmental Studies in Keene, New Hampshire. Chuck received a preservation leadership award at the Historical Society's 2013 Preservation Merit Awards ceremony for his work as an environmental educator and as a story­teller. He grew up in Hillburn and lives with his family in Nyack. Your editor reviews Back Porch Stories by Chuck Stead. Caroline Tapley serves as the secretary to the Board of Trustees of the Historical Society. For many years, she has been volunteering her time in our museum collections. member of the Historical Society Board of Trustees. 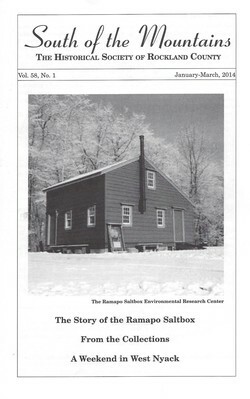 The restored Ramapo Saltbox Environmental Research Center, from the collection of Chuck Stead. Single copy price of South of the Mountains is $5, including shipping and handling.